Nowadays in China labor market, many companies are confronted with the challenge of how to successfully develop and retain employees in China. 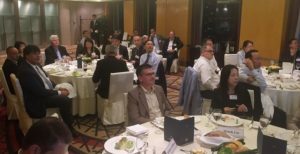 With this question as the theme, on September 7th 2017, the Business Club Shanghai gathered around 30 high-level management executives from multinationals and SME’s of various industries together in Shanghai Hilton Hotel with our first female keynote speaker Mrs. Tansy TONG delivering the facts and solutions applied within SCHINDLER China. The topic attracted heated discussions and exchanges and the event came to a successful end with the birthday celebration for our keynote speaker. The Business Club Shanghai is providing a platform for sharing views and experiences at business leader’s level. The Business Club in Shanghai follows the successful tradition of the Business Clubs in Zurich (Switzerland), Vienna (Austria) and Munich (Germany). The series has been initiated by Brainforce International, the leading Swiss-based Interim Management provider with its fully owned subsidiary in Shanghai and Oehen PR, the management consultancy for Public Relations, bridging Chinese and Swiss business matters.